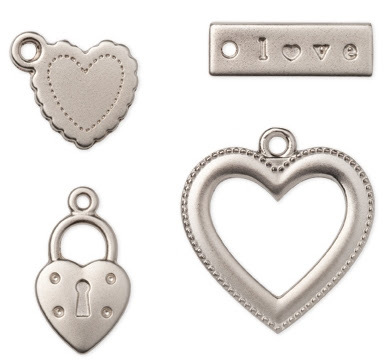 With Valentine's Day coming soon, you'll find that these Custom-designed heart-themed trinkets are an easy-add to your jewelry or papercrafting with fabulous results! Embellish with one or layer them together, as the jump rings and lobster clasps are included. The silver-toned finish coordinates with the Simply Adorned jewelry line. 4 total; 1 ea. of 4 designs. Largest heart is approximately 7/8" x 7/8".